Since I’m not worried anymore about seeing every nominee before I post my predictions, I thought i’d talk about one of the big slam dunk categories, Best Visual Effects. Recently, this category had been pretty easy to predict, especially when one of the films in contention is a Best Picture nominee. First, Gravity. Let’s cut the small talk. It’s winning. We all know this. So let me tell you something – I think that the effects in this movie are better than the effects in Avatar. Hear me out, folks. Even though Avatar was brilliantly immersive, you do kinda know when you’re watching it that what you’re seeing isn’t real. 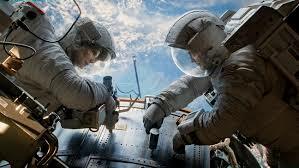 With Gravity, if you had told me that the film had ben shot in outer space, I wouldn’t be a bit surprised. The film’s effects are beyond words, and it’s winning. Ah yes, the other nominees. The Hobbit: The Desolation Of Smaug is the fifth consecutive film in the middle earth series to be nominated for Best Visual Effects. And the effects are… unseen by my eyes as of today, but i’ll see the film soon. Probably. Also, it’s not winning. They’re not going for Middle Earth again. Then we have Iron Man 3. And if I have to pick a runner up in this category, I’m picking this movie. A lot of people have seen it, and they’ve voted for Marvel before. (Spider-Man 2) Bottom line, this will be on voter’s minds. But they won’t vote for it. Not when something like Gravity is in the conversation. Then we have surprise nominee The Lone Ranger. Even though the film is a multiple Razzie nominee, it has gathered Oscar contention and has become the most unlikely two-time Oscar nominee since Jonah Hill. But how many people like the film enough to give it an Oscar? I’ll probably be seeing it this weekend, but I’ve heard some pretty bad things about it.